I thoroughly enjoyed this book! The world building in it is fantastic, and I found it easy to immerse myself in the setting. I also liked the differences between the characters, and how each one had their own quirks and traits. It has an interesting anti-hero plot going on, which was different from a lot of superhero stories out there. The plot of this book unfolds very slowly, with a lot of foreshadowing through the first three quarters of the book, which made it sometimes hard to continue. There were points where I felt like the plot was dragging, but it was balanced out with a lot of action scenes throughout and lots of plot twists at the end. 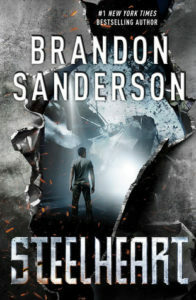 I have to admit, at first, the only reason I kept reading was because I wanted to see if the romance between the protagonist and his love interest would take off, but I quickly became really invested in the story, and found that I was always trying to find a chance to read more because I had to know what happened next. What really sold this book for me was the ending, which had some major plot twists that I didn’t see coming! And while I wasn’t necessarily kept guessing through the whole book, I was constantly wondering what was coming next. Finally, the writing style of this book was amazing! The protagonist’s voice was interesting and quirky, and I really loved Sanderson’s characterization of his characters.